What makes someone loyal to a company? Is it trust? How they treat customers and employees? The products or services they offer? How they interact with people? Take Wendy’s for example. Here are a couple screen shots from their Twitter account. 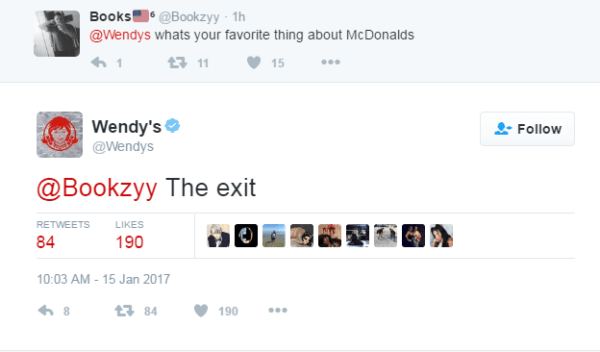 Wendy’s has gained a huge following on Twitter and is known for roasting other fast food chains and people on Twitter. 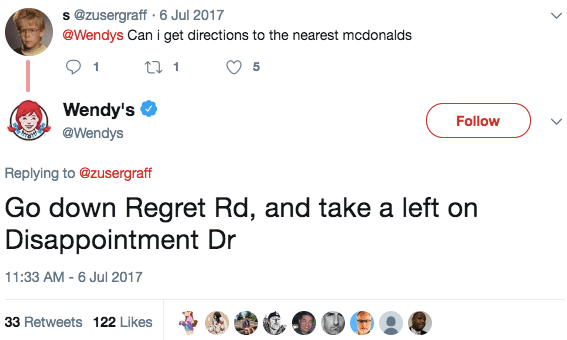 Wendy’s uses humor to attract attention to their brand, and they are one of the very few brands that can pull this type of behavior off. And then there are companies like Pampers. 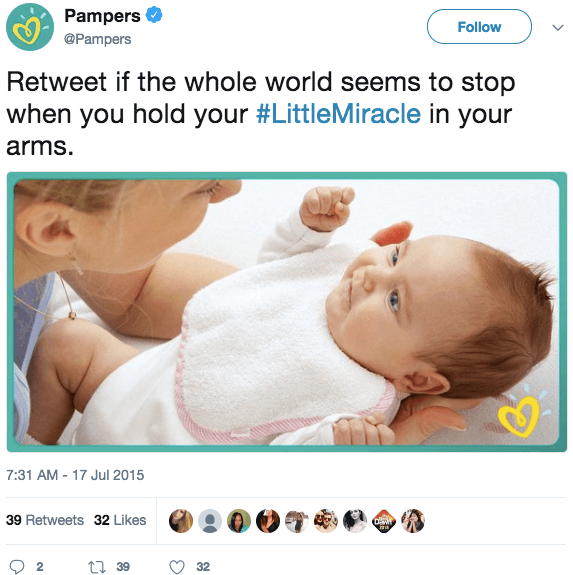 Pampers attracts parents and soon-to-be parents with all the feels. Who doesn’t love cute babies?! What companies capture your attention on social media? Think about a company you really like. How do they engage with users on social media? Does this company use humor or are they informative? Or are they positive, lively, or monotone? A company voice is what you say, and how you say it. 1. How do you want your company to make people feel? 2. What company makes your customers feel the way you want them to (see answer above)? 3. What do you want people to do or gain when they come in contact with your company? 4. What are three words that describe your company? 5. What company voice would you want to mimic? 6. What company voice’s don’t you like and why? (i.e. I don’t like Wendy’s voice and tone because they are too harsh, for example). 7. How does interacting with customers and potential customers make you feel? How does your company social media voice and tone sound? After answering these questions, what do your results tell you? Were your answers more lively? Positive? Cynical? Professional? Humorous? etc. This is a very initial step to discovering your company’s social media voice and tone. Take your findings and incorporate them into your social media content strategy.